Obviously, most of my bag orders are from women, but I have just completed by first order for a young man. 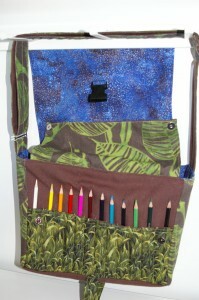 He is very artistic and likes to carry his supplies with him, so I designed a unique messenger bag that allows him to carry 24 pencils, his large sketch book and sundry gizmos and gadgets. He chose a somewhat eclectic selection of fabrics and I did the rest. The bag features an adjustable strap, large pencil pocket with a flap with magnetic clip closures, a zippered pocket, interior divided pockets, large rear pocket, waist strap and a panel for concealing the strap. 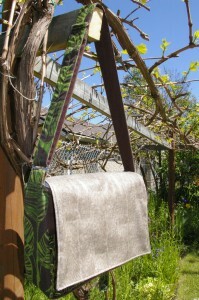 I used a variety of fabrics in this bag, including a snakeskin vinyl, outdoor fabric, cotton, fleece, polypropylene strap as well as various metal hardware and a parachute clip closure. 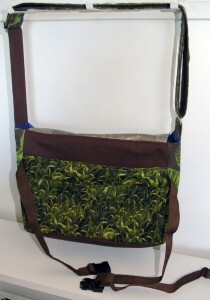 This entry was posted in custom order, new product, sewing and tagged "art satchel", "messenger bag", "snakeskin vinyl", adjustable strap, man bag. Bookmark the permalink.